In the interest of propogating Bhakti Bhava in the general public and for the sake of Loka Kalyanam, we have already recorded 108 Bhadrachala Bhakta Ramadasa Keerthanas composed by our Guruvu, Sangita Kala Nidhi Sri Nedunuri Krishna Murthy Garu and sung by Dr.Sheshulatha Viswanath Garu and other Vidwans by putting them in the sound cloud and also through our web site “www.bhadrachalaramadasu.com’ for the benefit of the devotees and music pattern. By the Grace of GOD, this programme has already gained momentum and got widely publicized through the above media. With the same spirit, in this Maha Yagnam another milestone “ANNAMAYYA PADA MALIKA” is being passed on to you. 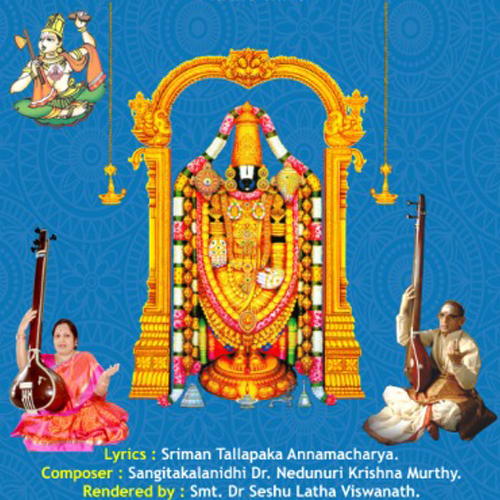 Our Guruvu, Sangita Kala Nidhi Sri Nedunuri Krishna Murthy Garu has composed more than 200 “ANNAMAYYA KEERTHANAS” and dedicated to LORD VENKATESHWARA. Out of the above, he himself has sung 108 KEERTHANAS in the programme titled “NADA YOGI” telecast through Sri Venkateshwara Bhakti Channel (SVBC) in the recent past. Our desire is to publicize the remaining KEERTHANAS composed by our Guruvu, Sangita Kala Nidhi Sri Nedunuri Krishna Murthy Garu through this “ANNAMAYYA PADA MALIKA” sung by Dr.Sheshulatha Viswanath Garu covering first batch of 27 KEERTHANAS. We are confident that the DIVINE BLESSINGS OF LORD BALAJAI will be showered on all devotees and music fraternity. We pray LORD VENKATADRI RAMA to bless us for completing the remaining KEERTHANAS composed by our Guruvu, Sangita Kala Nidhi Sri Nedunuri Krishna Murthy Garu in due course.